ghastly color. Gray, beige, greige…with a little pink thrown in. Maybe some of you thought, oh, just wait til summer, and when you get a tan, you’ll look better. Um. No. I’m pretty pale. Even in August, I just get pinkey-beige…greige, if we’re being honest.. 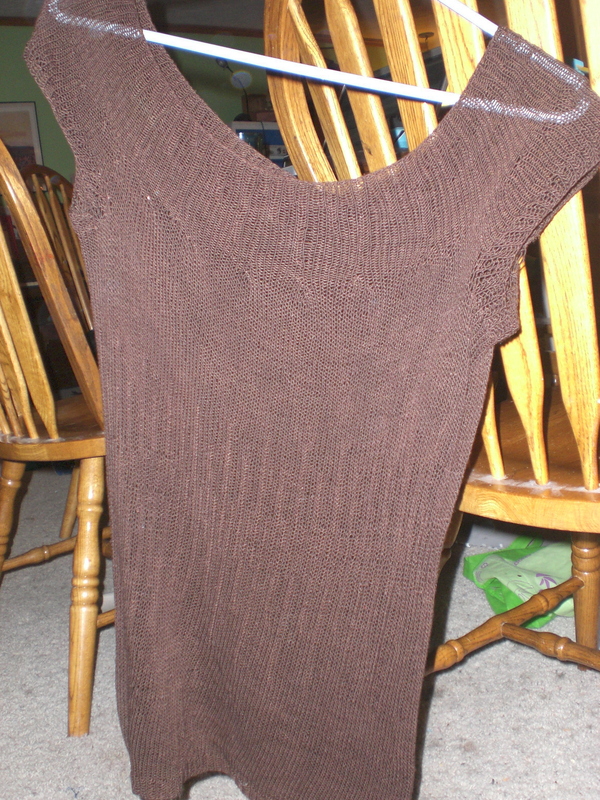 So, since I can’t color myself, I figured I’d dye the sweater. There is a bit of risk in this – sure, maybe the yarn was a 2 dollar investment, but the time is a big deal. Spending a month of free time working on something I can’t wear is disappointing. Each package of dye cost about $3. I only used one, but I wanted a back-up. 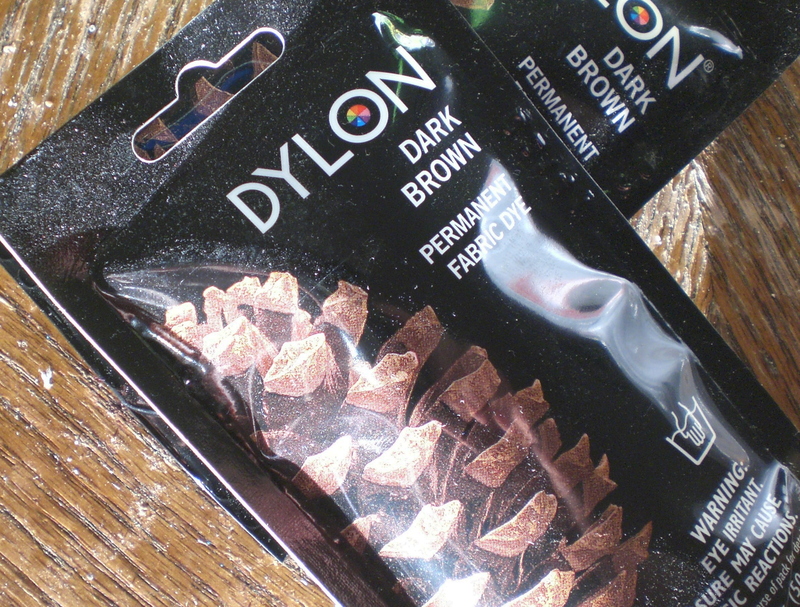 I doubled my investment with a packet of dark brown Dylon dye from the craft store. I chose it over Rit because I have used both before, and Dylon seems stronger- it dyes deeper and seems to last longer, too. My concern with dying an already-knit item was that the knit stitches themselves would act like tie-dye, so it wouldn’t take up evenly. In this case, I didn’t need to worry- the color took really evenly, and it is even a bit darker than I expected. I love my new sweater! Judging from some of the searches that have found me, people want to know if Kool Aid works for dying cottons or other vegetable fibers. As far as I know, no. I do know they will stain cottons, but I don’t think they will be colorfast on anything other than wools and silks. That is why I went with a packet of relatively toxic dye for this sweater, and why I didn’t let my kids help me with this project. I followed the directions on the package- I have an enamel roasting pan that I only use for dye. I used disposable spoons to stir with, I wore gloves, and I didn’t do it at a time when the kids would get underfoot. The dye is most toxic when in powder form- it is not something anyone wants to breath in. I mixed the dye according to package directions, and did most of the dying outside. 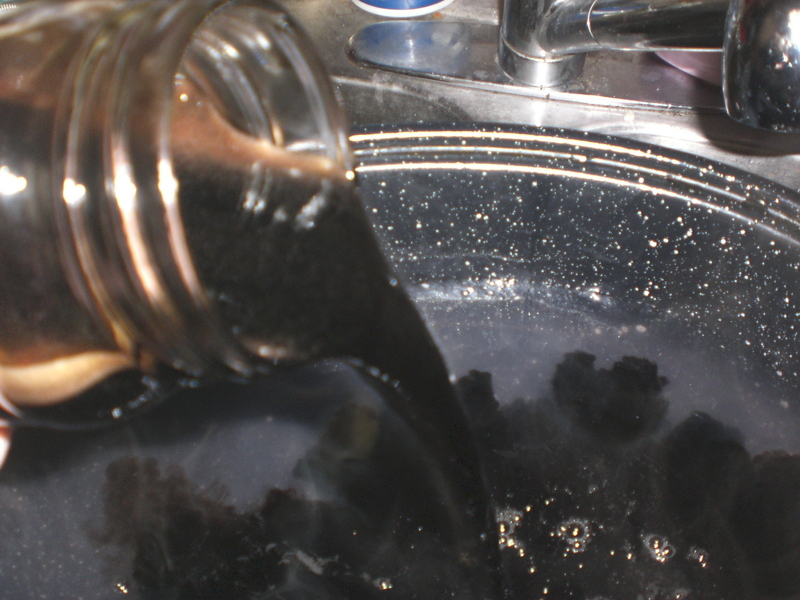 However, once it was mixed, I didn’t want the boy hopping through the kitchen and spilling a gallon of dark brown liquid. Yikes! can you even imagine? 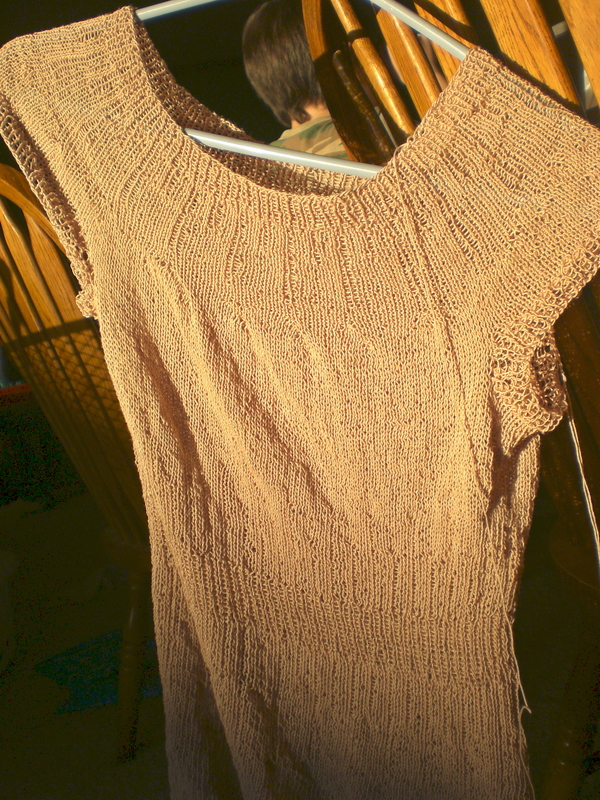 I washed the sweater first, then left it wet and put it in the dye. The directions say to stir for 15 minutes then let it set for another 45. I kind of got distracted and left the pot on the back porch for over an hour. It may have done some longterm damage…but I can’t tell at this point. I’m really happy with the color, and can’t wait until it’s warm enough to wear it.